Let patients know that oral piercing goes beyond style – it’s a health issue, too. 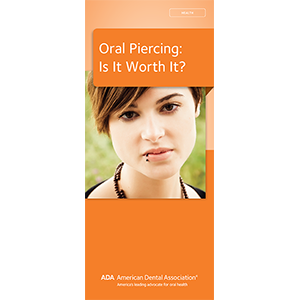 Our cautionary brochure details the dental and overall risks of piercings while letting patients know how to minimize risk if they already have piercings. Includes "cause-and-effect" photos of gingival recession from tongue jewelry. 6-panels. Minimum order 150. Click Add to Cart then personalize for free. Now you can add personalized information on the front, back, or both covers on all brochures.